When Anna's husband saves a young girl, Molly, from a raging river on a day out, he doesn't survive. He wasn't good with money and Anna and her two children, Jenna and Josh, are being left with nothing. Nate, Molly's father, is feeling guilty about what happened and he wants to help Anna and her children. He's rich, but Anna doesn't want to accept money given to her because of guilt about her husband's death. She's desperate though and when Nate offers her a job and a place to live, she has no choice but to say yes. Anna is helping Nate with Molly's care. Molly doesn't have any siblings and spending time with Jenna and Josh has a healing effect on her spirit. The silent and shy girl comes out of her shell when she is with them. Merging the two families might seem like an ideal solution, but Anna is wary. She can't completely forgive Nate for having to work and not being there to save his daughter on the awful day she lost her husband. What will happen when the handsome Nate shows an interest, can she resist his charms? Will she be able to get over her grief and give Nate a chance to make her life better again? In a Heartbeat is a beautiful romantic story. Anna is a kindhearted woman. She loves her children and will do anything for them. Her husband was irresponsible and superficial, but he was cheerful and always happy. She misses part of him, but being left with nothing makes her angry as well. Nate offers her a way out of the dire situation she and her children are in and even though he's the last person Anna wants to spend time with, she accepts his offer. It was fascinating to see where that would lead. They slowly get to know each other and there are plenty of sparks, but Anna isn't ready to fall in love and is still grieving. She has to find a way to heal before she can let love in again and Janice Kay Johnson describes her journey in a fabulous poignant and open way. In a Heartbeat is a story about true love, second chances and making things right. 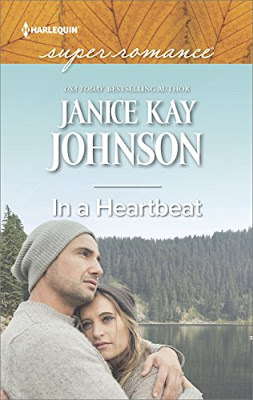 I was impressed with Janice Kay Johnson's heartwarming writing style and could easily understand all of the emotions her main characters are going through. 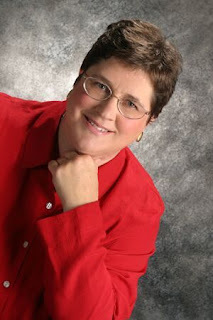 She writes about both adults and children in a wonderful sympathetic way. I was curious to find out if Anna could forgive Nate and couldn't turn the pages quickly enough to read more about their complex connection. I read the book in one sitting and didn't want to put it down. I really enjoyed reading In a Heartbeat, it's an amazing endearing story. If you love romantic stories about second chances in life you should definitely read In a Heartbeat. We humans aren’t always as introspective as we could be. Which is a major understatement. But if you’re a writer, a few books down the line you start to notice that you’re drawn to certain themes, that the romantic conflict in your books seems to have an echo, that what makes a man heroic in your eyes and a heroine strong isn’t necessarily the same as in books you read by other authors. What qualities allow us to trust another person? What behavior is unforgivable? What part of my writing really is fiction, and what part is me struggling to understand why certain things happened to me – and trying to see those events with a different perspective, maybe give them a happier ending? I’ve long since recognized that what interests me most as a writer is what happens to people after a trauma. Sure, in my suspense novels I write trauma as it happens: people getting shot or kidnapped or having a child abducted (and can there be a worse nightmare than that?). But even in those books, my characters come to the story bearing old wounds. They wouldn’t be very intriguing people otherwise, right? But a whole lot of my stories begin with something bad…and then we see the ripples spreading from the stone that’s now sinking to the bottom of the lake. I’ve gone so far as to start with a massacre (A Hometown Boy) and a child who got his hands on his father’s gun and shot and killed another child (To Love a Cop). A satisfying novel, be it romance, murder mystery or literary fiction, involves the change characters undergo. Change is slow when life is placid. But when something drastic shakes us up, that’s when we face who we really are and what we’re capable of. In a Heartbeat is one of those books. He may be indirectly responsible for the death of her husband, for her children losing their father, for her discovering the lies her husband had told. Can my hero somehow atone? And if that’s what he’s doing, is it really love he feels? How does he know? How does she know? I’ve said this before, but will say it again: I’m actually a little ashamed of how happy I am when I have a story idea like this. When I’m writing, there’s nothing more fun than starting with characters who have a massive tangle of conflicting emotions that have to be unknotted, thread by thread. To me, a love story is most powerful when it’s laced with a serious dose of reality – but that doesn’t mean it has to be a contemporary romance. Think, for example, about Patricia Briggs’ Alpha and Omega books, urban fantasy. Anna (yes, a werewolf) has suffered astonishing trauma and Charles has been forced to assume a role in life that is painful to him. The hurts these two bring to their relationship enriches it immeasurably. I’ve long since realized that I emerged from my childhood with a form of post-traumatic stress disorder, largely because my father was a World War II veteran who had serious (and undiagnosed or treated) PTSD. Years of living with constant tension isn’t something you can shake off as soon as you leave home. Yes, I’m probably still tugging a thread now and again from the gigantic knot and thinking, Huh. So that’s why. I’ll bet if you really think about why you love certain authors, certain kinds of books, you’ll find you’re following a thread of your own. It may lead back to your childhood, or a broken relationship or marriage, or a happy time in your life. There’s a reason some books are so satisfying, why you want to read them again and again. Call it therapy. In fact, I think I need to go book shopping right now! One very lucky reader of With Love for Books will receive a signed paperback copy of In a Heartbeat by Janice Kay Johnson. Love a good romantic story. Sounds wonderful. Sounds like a lovely story, thanks for the review & chance to win. In a Heartbeat sounds like a beautiful romantic story and shows how the power of love can bring happiness. I do love to read romance, this looks like an unputdownable read to me! Oh how quickly your life can change! I saw this review on GR yesterday and it sounds really good. Happy Release! What a lovely romantic novel. Love the blurb! I would love to read it. I enjoy second chance romance stories and this one sounds like one I'd really enjoy. Just what I like - a good tear-jerker! I agree with you, Janice, I too find that the most powerful stories are heavily based in reality. Oh this sounds so good. I cant imagine what both of them would be going through...that would be so hard! I will be cheering them on as I read this!!! Love the sound of this. A romance out of heart-break, one of my favourite topics. Might need the tissues but at least there's a light at the end of the tunnel too. Really interesting guest post Janice; your description of untangling the knots is spot on. I just love guest posts. I think I like mysteries and crime fiction the most but I really don't want to be a criminal, lol. I think it's probably more about solving the puzzle the author gives us and then being able to say 'Ha, I knew it' though that isn't often the case. It's not easy bringing up children on your own but like you I've managed and they turned out pretty well too as no doubt your daughters have too. My father served in WWII too, however he luckily didn't suffer from PTSD on his return home. That must have been very difficult for your family. A pity nothing was known about PTSD back in those days, many will have suffer from it no doubt.